On My way to Turks & Caicos! My girlfriends and I recently enjoyed a long weekend “girls trip” to this beautiful island. This was in the month of November when the temperatures in the northeastern parts of the United States were rapidly falling and we were all in need of a little sunshine. We spent 5 days on this breathtakingly beautiful island and the only thing I (kind of) regret is not photo documenting the entire trip. But, that is the magic of this place; It makes you slow down, unplug and completely immerse yourself in all it’s splendor. Below you will find a travel guide that can be handy if you ever find yourself planning a getaway to beautiful Turks and Caicos. A fair warning - Turks is not a cheap place by any stretch of the imagination. It is very much geared towards luxury and not at all considered a budget destination. Several islands make up the Turks & Caicos Islands and thus there are several airports. Since we were going to Providenciales , we flew into the Providenciales International Airport (PLS) which is the main airport on the island. We all flew separately from different North East airports. The cost from New York (JFK), Washington, DC (DCA) and Pittsburgh (PIT) ranges from $450-$600 at that time of year. We also rented a car upon arrival so that we could not only get to our villa in Provo but enjoy exploring the Island. We rented from Grace Bay Car Rentals for around $220 for 5 days. You can get around via Taxi or rental car. If you are staying at a hotel in Grace Bay (touristy area) and have no plans to leave your resort then this might be unnecessary. However, if you’re staying away from the resort area (like we did), you will need a rental car to get around. 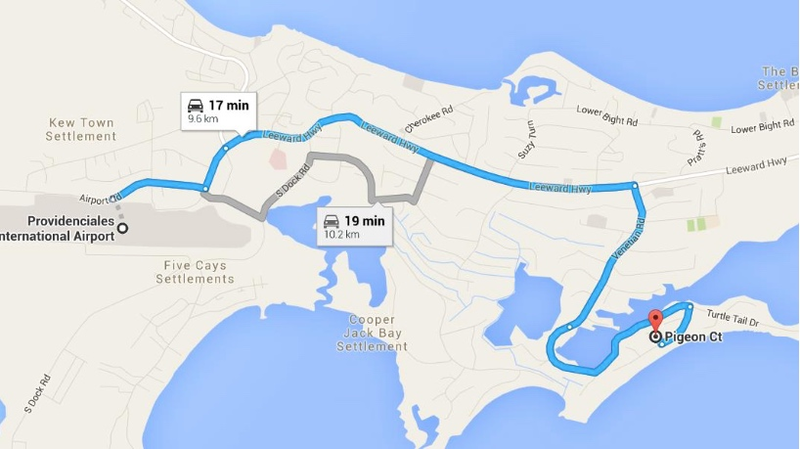 Keep in mind that in Turks and Caicos, they drive on the left (the British way). Most steering wheels will be on the right. Not to worry if this freaks you out initially, my American friends adjusted quite quickly. The local currency is the United States Dollar (USD), so no conversions to worry about for my American friends. Since this is the Caribbean, expect tropical weather. The average temperature ranges between 80-90 degrees year round with sprinkles of showers randomly which seizes quite quickly. Our Villa was exquisite! We stayed at Sunrise Ridge - the main house, and it was phenomenal. It is located in the exclusive Turtle Tail neighborhood of Providenciales and is a 5 acre estate set on one of the highest points of the Turks and Caicos islands. The ridge has captivating views of the Ocean, Flamingo Lake and the island of Providenciales. Our villa came decked with a swimming pool, Barbecue, outside dining, private decks and a fire pit. It had everything we needed and was stocked with things from blenders to coffee makers to beach chairs, umbrellas and coolers. Cost was ~$1000/night and varies depending on the time of year. This Hammock By The Pool Was My Favorite Spot. Since we stayed in a villa, we stocked up on food at the nearby grocery store - Graceway IGA Supermarket, which was about 10 minutes away. Even though we had ample food at the house we wanted to experience the restaurants on the island. The Deck at Seven Stars - We went here on our first night in Turks for something quick to eat. We ended up grabbing bar food (choice from the menu) and was quite satisfied. The conch fritters are divine. Infiniti Restaurant & Raw Bar at Grace Bay Resorts - Go here on a Saturday night when there are lots of people and the energy is high. However, expect long wait times for food as they get super busy. The food and drinks here are quite pricey but really good. Coco Bistro - Located in the heart of Grace Bay in walking distance of all the resorts. The food and atmosphere are really nice and a must try. Hemmingway’s - We ate here on our last night in Turks. The ambience, customer service, food and drinks are excellent! I had the curried lobster and wanted more when it was done. Don’t let the look of this fool you. 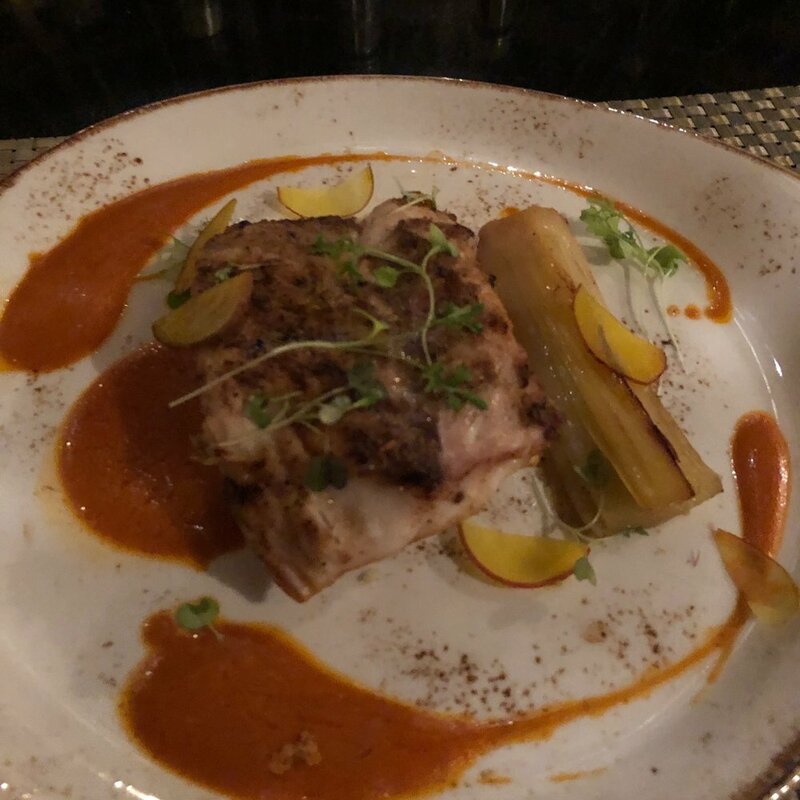 I waited a very long time for this Grouper from Infiniti Restaurant and it was worth every second. You go to Turks because of the beaches! and the main one is Grace Bay Beach on the north side of Providenciales. Horse back riding tour with Provo Ponies - this was quite fun and rather relaxing. Sunset drinks at the very modern, and sleek boutique Hotel Gansevoort - One of the best things here is the beach bar. The drinks are really good and they make a mean mojito. Snorkeling at Turtle Cove - We didn’t make it here but were told by the locals that this is the spot for snorkeling as Smith’s Reef is VERY beautiful. Bonefishing at Juba Point Salina - If you’re into bone fishing, this is where it’s done because of the low depths of the water. The water here isn’t suitable for swimming, kayaking, paddle boarding or anything of that nature. Flamingo Lake to see the flamingos - Want to go flamingo spotting? Flamingo pond is where you want to go. The number of flamingos will vary with the time of year. As I mentioned, the one thing I (kind of) regret is not taking more photos. If I had thought about doing a travel guide I certainly would have. However, a visit to Turks and Caicos should definitely be on your bucket list in my opinion. It is one of those very simple yet breathtakingly beautiful destinations that you ought to experience. Of course, do your research and have an open mind.